What board games do you know? Some will say checkers and chess, some will also recall backgammon, Go and Renju, some may name Monopoly, dominoes and tic-tac-toe. But there would hardly be more than 10-15 entries in your list if you had to list them. Meanwhile throughout its history humanity came up with several hundreds of board games – that said, many of them were lost, disappeared together with civilizations that invented them. Today among various objects discovered by researchers during archeological excavations there sometimes are ancient board game sets too. However, no written rules are usually to be found with them, so nobody knows how to play these games. But it turns out that there are some people interested in reconstructing the rules of old games. 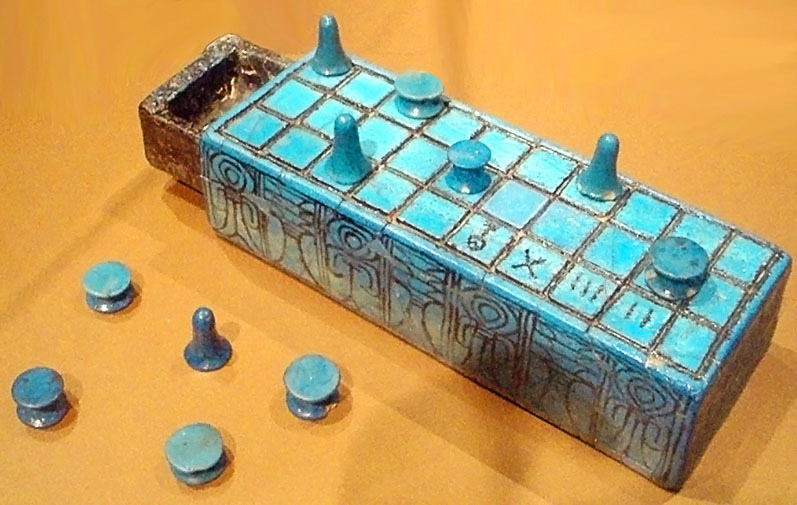 This process is somewhat similar to an extremely exciting but very complex intellectual detective story, where one has to use clues and leads left by our ancestors (such as the form of figurines included in the set, the coloring of the board or the size of the stones) to “get into the heads” of the game’s inventors and uncrack its rules. We had a talk with one of such people, so please meet Dmitri Skiryuk. Science fiction writer, journalist, expert on researching ancient board games and reconstructing their lost rules. – When popular media report on artifacts found during some excavations these are usually fragments of pottery, dishware, coins or labor instruments. But I, for one, have never heard of archeologists having discovered some ancient board game. Why does practically nobody ever talk about such things? Among other archeological findings games are often considered by historians to be something of a lesser value. In my opinion, this is not a correct approach: games can often give us much more ideas about the lifestyle, culture and worldview of ancient civilizations than any other objects. Of course, archeologists do study the cultural and historical significance of the discovered games but they pay little attention to their rules. They do provide the supposed rules in their papers, but for some reason nobody ever thinks about trying to play the games according to these rules at least once. 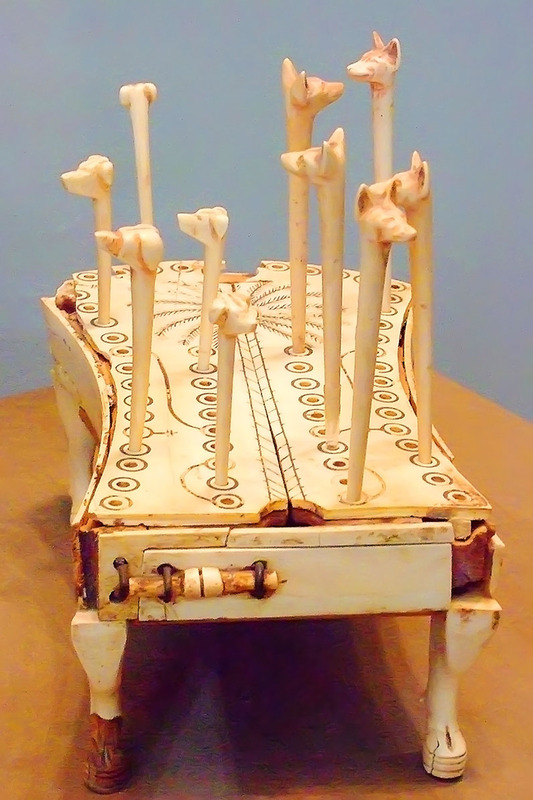 When I came across such Ancient Egyptian games as Senet and Shen (Hounds and Jackals) and tried to play them according to the rules established by historians, it amounted to nothing – there was no excitement in playing these games and sometimes it wasn’t even possible – the game would often hit a dead-end. This could mean only one thing – the rules were incorrect. 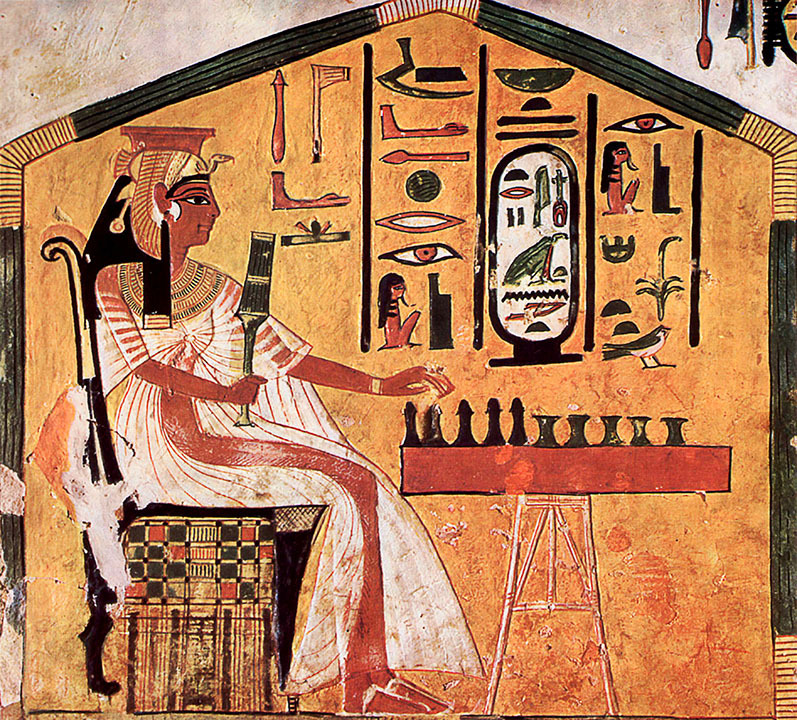 A fragment of an Ancient Egyptian fresco painting depicting the spouse of Pharaoh Ramesses II, Queen Nefertari, playing Senet. – How often are “new” games discovered? A lot of tombs have been unsealed in the recent years: mostly in China and areas with military operations going on – Iraq, Iran, Syria. Some absolutely incomprehensible and unknown board games are often discovered in these tombs. One to three new games are discovered every year. In most cases they survive in the form of fragments, remnants or pieces of game boards. But when the search becomes really broad-scale and the tombs are opened very carefully and without pillage, then completely whole, untouched sets can be found as well. Just as any other of their favorite things, ancient people would take them with themselves into afterlife. This was elevated to cult status. History even knows cases when before a game was put into a tomb it would be thoroughly repaired and renovated. But almost every time when trying to find out how this or that game was supposed to be played, one and the same thing becomes clear: the rules have not survived, because ancient people simply did not write them down. I do not know why; perhaps, they thought this was meaningless: “This game is played by 3 million people. Do you think all 3 million of them are going to forget the rules?” Or it might have been some sort of sacred knowledge. It is very rare that any kind of equivoques or short remarks about the rules survive but even then they are often written in some very complex language with a lot of incomprehensible symbols. Of course there are exceptions, like the game of Alquerque whose rules were fully described in the book of Alfonso X the Wise, King of Castile and León. But even that does not give us full insight into how to play that game. The truth is that when they wrote down the rules, they omitted certain aspects that were believed to be clear by default. But alas, today we do not know what those aspects were. – What brought you to reconstructing ancient games in the first place? The first game I did was a game from the ancient city of Ur. It was very well preserved: the board, the pieces, the dice – the whole set was intact. By that time there had been two or three reconstructions of that game’s rules, but none of them satisfied me – it was impossible to play by those rules. I spent about two months trying to crack the game’s algorithm but in the end I was able to do that. From that moment on I understood that algorithms of games can be reconstructed. It is a very complicated and problematic thing but it is possible. For the past two years reconstruction of games and making game sets has become my main occupation. During that time we successfully uncracked three games: the Sumerian game of Ur and the Ancient Egyptian games Senet and Shen (Hounds and Jackals). Currently we are working on the Scandinavian game of Hnefatafl and the Ancient Chinese game of Liubo. The latter one is also being quite successfully uncracked by Chinese scholars alongside with us, but it’s still largely unclear how to play it. – What does the game reconstruction process include? We have a well-established method. It is very difficult to figure out the rules that would allow the game to work hundred per cent. So a game should be uncracked on practice, by constantly double-checking the efficiency of any assumptions. Empirically, without playing, you won’t be able to unriddle anything. So we play the game and check one possibility after another. And any rules that cause unsolvable dead ends are usually sifted out. A compulsory condition is manufacture of the game set in its original form. Besides the rules, a game usually has its own ergonomics as well: how a game piece should be picked up, how it is supposed to be moved across the board. People have changed very little throughout the centuries: we still have two hands, four fingers and a thumb on each, and the shape of our hands is almost the same as it used to be centuries ago. Game ergonomics can give you a hint at how a game should be played. For example, if a piece’s shape makes it uncomfortable to pick it up from a certain position on the board, it probably means that piece should never occur in that position at all. The realization that you have disclosed the game’s algorithm comes when the game begins to run smoothly, like a well-oiled mechanism. And you get the feeling that you have assembled a complex device that you could never assemble previously – all of a sudden you have it up and running. 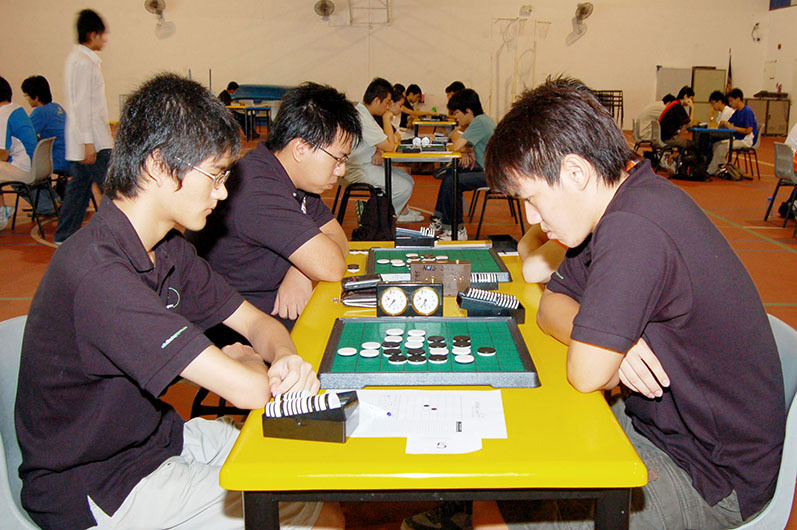 The game becomes very exciting and engrossing, it no longer creates disputes or controversy. You may still have small questions left unanswered, but you understand that its main engine is already running. – What knowledge does one need to possess to be able to reconstruct ancient board games? A person who does that needs to understand the historic period of the game in question, the culture and lifestyle of the people who came up with it. Another important thing is knowledge of game theory and game mechanics. Often to uncrack a game you need to learn to think the same way as Ancient Egyptians, Ancient Sumerians or any other peoples used to think. And that is extremely difficult. Ancient people had entirely different thinking. Even now thinking in Chinese, Japanese cultures or many cultures of Africa, for instance, is very different from ours, which means we have very similar minds but a great number of different ways of using it. Games give us the understanding of not only other algorithms, other cultures, but also other ways and styles of thinking. For instance, when an Ancient Egyptian sat down to play a game, he believed he was playing it with gods and that he does it as their equal. By playing through Senet he would earn himself an afterlife. The Great Eight of Thebes was at the same time the Great Nine, because it included the demiurge god Ra-Horakhty, who other gods were parts of, so 8 equaled 9 in this case. And this is reflected in the game. If you don’t know this, there is no way you can solve the game’s riddle. 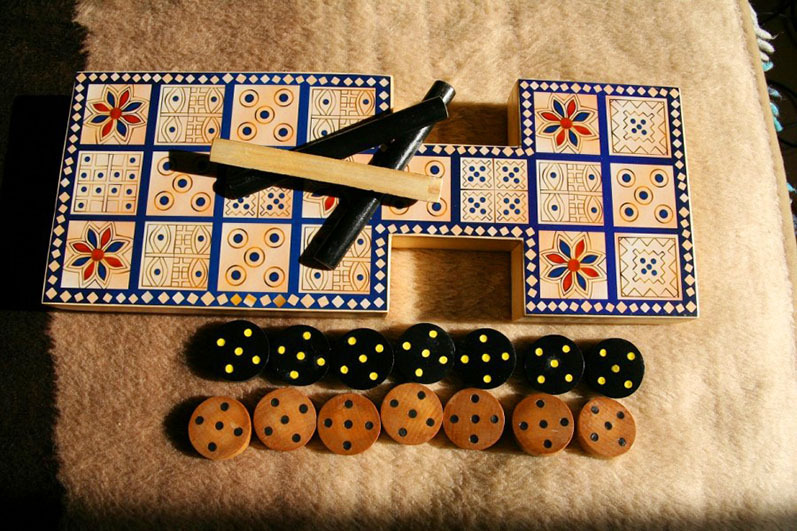 Ancient Egyptian games Senet and Shen. – You said that archaeologists’ attitude to board games is rather superficial… I would assume they don’t consider their role in civilization development significant enough. But is that really so? We must understand that games are communication, interaction of players with each other. Games are logical systems used by people to interact during the game process. We have a certain sacred area where we establish certain rules. We cannot move a knight like a bishop or move a bishop like a queen because we have established the rules and have agreed to follow them. And this creates a temporary perfection within the confines of the game. And the realization that perfection is achievable, that it can reign at least here, at least locally, at least for a limited amount of time – this realization elevates a human being, dignifies them, gives them understanding that justice and fairness exists and can be achieved. Following the rules at a sacred area always extends to real life as well. People playing with each other using logical systems becomes everyday practice. And the well-known phrase “Life is but a game” speaks exactly of that. There is one more important thing people often forget about. The fact is that games in the mind of ancient people were not really games. For them, games always were partly a sacral practice, partly a competition, partly an agreement with gods. According to ancient people, gods always interfered in the game. Some games were also related to fortunetelling. For instance, Persian astrologists used backgammon to tell the future fates of their kings or even whole kingdoms. 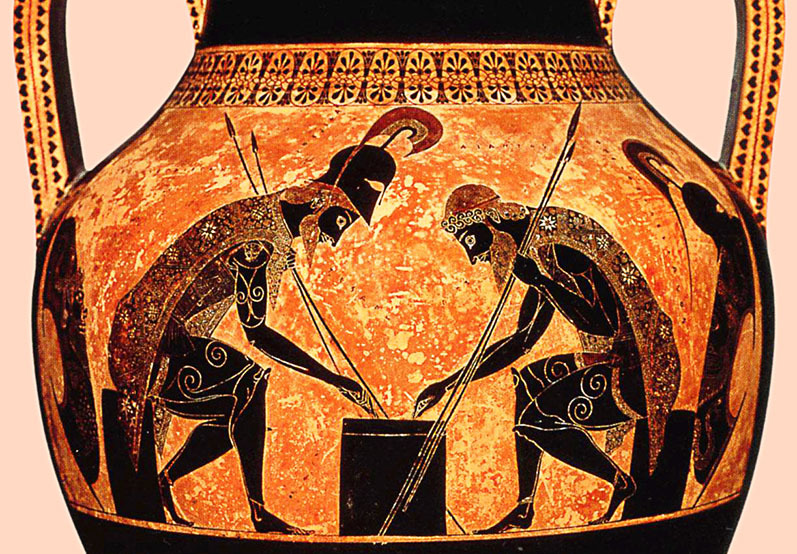 Ancient Greek heroes Achilles and Ajax playing a game (supposedly dice). The heroes are naming the numbers that just came out in their game: three (tria) and four (tes[s]era). Here is what I would pay attention to here. Any game has a certain goal – achieving this or that or defeating someone. As a general rule applied to modern games, as soon as you reach your goal, the game loses its meaning. Games these days rarely feel like a good novel – more often they resemble a bad joke which you wouldn’t like to hear a second time. As soon as you have beaten a game, you are not interested in doing it the second time because this time you will be able to do it with your hands behind your back so you won’t get any pleasure from that. So you need a sequel of the game instead. And this turns into a never-ending vicious circle. Victories in modern games can usually be achieved relatively easily, but the result does not bring any satisfaction beyond momentary gratification. So we waste a lot of time on transitory pleasures that don’t give us any real satisfaction. And I think this all started when Tetris came out. It’s a terrible game (I mean in terms of game philosophy). The goal is to get the highest possible score. But any way you slice it the computer is going to win. I have met people who developed psychotic disorders by playing Tetris. While the game of chess, for instance, makes you come back to it again and again. It isn’t right to downplay the importance of checkers either. The great checkers player and world champion Marion Tinsley used to say that chess is similar to looking at an infinite ocean, while checkers are akin to gazing into the abyss. And this is a very exact and clear description because these games are profound enough to study them throughout one’s whole life. They have algorithms that we will never fully comprehend, but trying to approach perfection gives extraordinary pleasure to a thinking person. – What is the ultimate goal of chess? Or the game of Go, for instance? The ultimate goal of Go is to achieve balanced unincorporated interaction with your partner. As soon as you put that task before you, you solve several problems at once. You stop being annoyed with your losses and you start accepting your wins as achievements. If your ultimate goal in Go is to win, then wins will soon cease to please you because you will start to take them for granted, but losses will really distress you. And that distress will be even bigger if you lose to a computer. But we forget that the computer is indifferent: a piece of hardware does not feel any joy after winning a game or any sadness after losing one; in fact, it isn’t aware of your existence at all (or of its own existence for that matter). 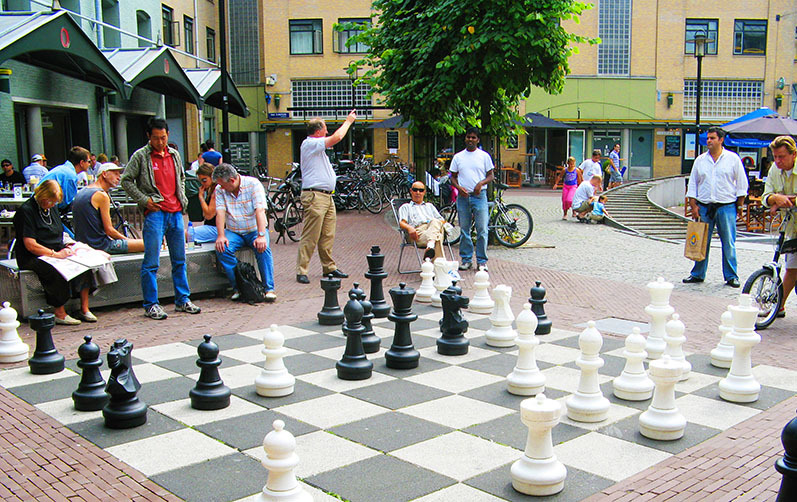 The goal of chess is a different one – it is to strategically defeat the hostile army. There are about five hundred ways to achieve that, and the opponent has ways of stopping each of them. Can you imagine what huge quantity of possibilities this presents? And by the way the game of Go has even more options. All the stones acquire meaning only when they are arranged in a certain shape. The most complex structures can open up to us within this interaction. You could as well ask me: “What is the goal of learning to play the piano?” The goal is not to perform Beethoven’s Fifth, the goal is to master the instrument. So the goal in chess and Go is also to master the instrument. You can only get pleasure from playing these games after you have really learned to play them. – And what if we compare real life chess to computer chess, will the goals be different then? Playing chess with a computer is intellectual training, like trying to solve a logical puzzle. But you will not get any pleasure from such a game, just as well as you won’t learn to play really well. It is similar to punching a punching bag: you will learn how to punch but you won’t become a fighter. When you sit down to play a game with a human after you have played two hundred times with a computer, you won’t understand why you are suddenly losing every game, while you’ve learned to beat the computer with your eyes closed. The thing is that a human player thinks while a computer solves logical puzzles. A computer is not invested in the game; it does that only because some people have put a certain algorithm in it. When a computer performs certain tasks, this conveys nothing to us. But if I start playing chess with you I will definitely make a reconnaissance move – I won’t feel sorry about sacrificing one pawn but I will see how you react to that move. If you capture that pawn I will think to myself: “This guy is adventurous and a bit greedy. I can use that to my advantage”. But if you retreat and strengthen your defense, then I’ll think: “This person is quite meticulous and careful: he keeps his defense tight and spares his resources. He might even be a bit cowardly. Let’s test him again: here is a bishop for you. Will you capture it?” So by mid-game I will have an almost complete impression of you even if I have never met you before. Unfortunately, we now have a whole generation of people who are afraid of playing games. When I offer someone to play, their first reaction is often similar to “No, I don’t play” or “No, I can’t play”. Unfortunately, these people are in the majority. Even those who give it a shot and play would often think that playing games is bad. We have a general consensus of games being some sort of nonsense, a waste of time, and people don’t shy away from openly stating that. For instance, I was traveling by train once and I got into a conversation with another traveler in my compartment, and I told him what I did for a living. When I mentioned checkers, he started laughing and said something to the effect of that game being utter rubbish. I offered him to play. So we arrange the pieces and it turns out that he doesn’t even know how to make moves, not to mention the rules. And what he thought to be the game of checkers was actually “Chapayev”, in which you knock the pieces off the board by flicking them. And that man was about forty. Do you understand the scope of some people’s ignorance? Children are a separate story. When they lose they often throw ferocious fits: they feel upset, they cry. You see, their parents convince them that whenever they lose they become a worse person, they failed the test, they are misbehaving, they dared to play and lost, they are a disgrace. But in fact it’s enough to talk to children about games and explain them a few things, and they usually get it pretty soon. In general, I think there are four types of bad players. I have organized about 50 Game Room gatherings, and I can see these four types very clearly. Probably it was these four types that killed the whole game culture. I decided to call the first category “fidget boy” (because girls are rarely like that). It’s a hyperactive kid who runs around the table yelling, drops the game pieces, builds a pyramid out of the game set, the pyramid collapses and falls, then the kid gets under the table and hits his head against it. Every Game Room usually has someone like that. The third type is the “know-it-all”. As a rule it’s a middle-aged person in spectacles, often baldish and in an overcoat (which he never takes off for some reason). He comes to the game room, skews at a Mancala board and says: “Oh, I know, that’s backgammon.” So I ask him: “Have you ever played backgammon?” – “No, but what’s the point of playing it? It’s clear enough as it is.” – “Let’s play one.” – “Why would I play? I can figure it out without it”. Then he would stand behind a chess player and give advice along the lines of “Why doncha move your horse?” And then he comes up to a checkers player and says: “You could play a really long sequence here. Pity you can’t see it”. But in fact he can’t see anything either. And the final type is the “smart child with a dumb parent”. As soon as the child (who can be of any age between 5 and 50) begins to concentrate on the game and makes a move, the parent immediately interferes: “What are you doing? If you make this move now, your opponent will make that move. You shouldn’t move this piece, you should move that piece”. And the parent’s advice is usually a bad one. The child quickly starts losing, freaks out and soon they both leave cursing at each other. But fortunately most people who visit our Game Rooms are really nice, well-meaning, interesting people who really want to play games, discover something new, develop. Some of the most popular games today. Chess, Go, reversi. – Why do you think some games have passed the test of time while some others disappeared after having existed for some time? There is nothing strange in that. Games do not exist in some sort of a vacuum outside culture and human history. If a game drops out of the cultural space it dies immediately. If some historical realia that the game existed within go away, then the game vanishes completely in a matter of two decades. I will give you an example. In the late 19th – early 20th centuries in Europe (which used to be a peaceful and progressive conglomerate of countries at that time) about 20 very interesting game systems emerged. After World War I these games disappeared because the whole generation that played them was “knocked out”. Even the rules had not survived. One of the games that disappeared then was Salta, and it was considered the second most complex game after chess. The three-dimensional chess called Raumschach also disappeared. 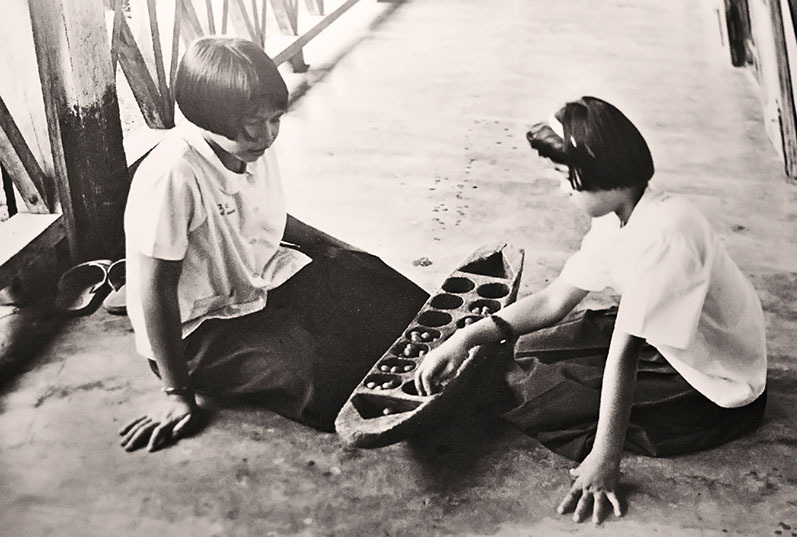 And the game of Reversi also disappeared – however, this game had the luck of being reinvented in 1976 by Japanese inventor Goro Hasegawa who marketed it as Othello and brought it into circulation. He did not even know that Reversi had ever existed. Today it is one of the most popular modern games. Games can also disappear when certain cultural layers of humanity change. This can mean pretty much anything. For instance, at first people invented a dice with two faces, then one with four. But as soon as a hexagonal dice came into being about half of the games vanished within 300-400 years (which is a trifle in terms of history) – these games were wiped off by cultural progress. A large number of games that existed within different cultures were destroyed by the clergy. Mostly these are board games of pre-Columbian America. In deserted Mayan cities such as Palenque, Chichen Itza and Teotihuacan they have flagstones with game boards of various shapes carved out in them. Nobody knows how to play them and probably nobody will ever know. That civilization died out, and these games vanished with it. But in this case the games were being destroyed on purpose. The hate of churchmen to them is easy to explain. As I have already said, most ancient games were related to gods. But these were gods of Native American tribes, so they were alien to Christians. For instance, the Aztecs had the game of Patolli which had one of their gods “participating” in the game. It was the god of sports and board games, dancing, singing and music. His name was Macuilxochitl (Xochipilli) – the god of “five flowers”. Sometimes that game would have a moment when a player could not make a move: he would throw the dice, but the dice would show the result that did not allow the player to move his pieces anywhere. In such cases the player had to put one stake (e.g., a coin or a cocoa fruit) into a basket intended for that god. And when the game ended the winner received not only the stakes but also the contents of the basket as the god’s gift. Of course, Christian clerics could never let such games survive. As a result Native Americans only have one game that survived. And it isn’t an Aztec game but a Mayan one. It’s called Puluc. Puluc (or Boolik) means “corn” in the Mayan language. The night before planting corn they used to lay tables, burn lights and play that game because they believed that would make the corn seeds soak up light and joy before being buried deep in the ground. This game also had religious implications, but the Christian clergymen did not understand what people were playing so they did not touch that game. Nowadays nobody destroys games on purpose but I’m afraid they can disappear by themselves if we do not play them. We should not forget that games are interaction and communication: we take a chess board and go visit our neighbor to play. With development of the Internet people mostly choose to play games with themselves: Tetris, Lines, Minesweeper… You rarely meet someone who plays checkers, and it’s almost impossible to meet anyone who plays at least two different types of checkers (of which there are over twenty types overall). 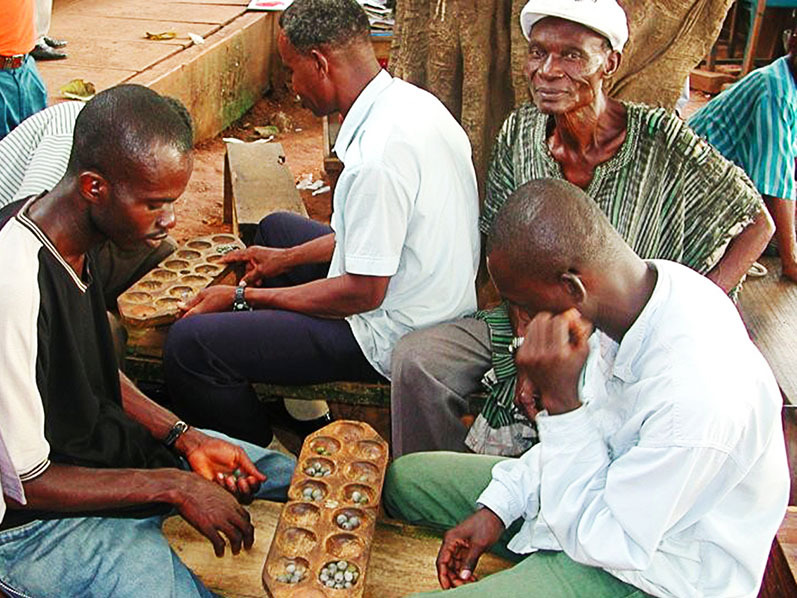 Mancala – a family of board games mostly widespread in Africa and some areas of Asia and often also called “sowing games”. The importance of mancala for Africa is about as big as the importance of chess for the Western world. 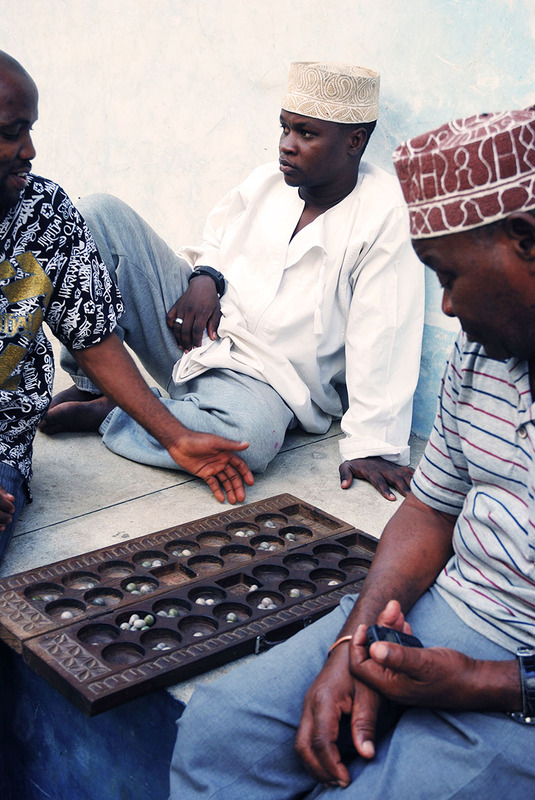 There are a lot of mancala games, the most popular ones being Oware, Bao and Kalah. – Are there any ancient games that were completely lost but then rediscovered and gained a lot of popularity? The only thing that probably comes to mind is the game of Daldøs that was lost completely at one point but was later reconstructed by some enthusiasts from Norway and Sweden. They spent several years trying to find the surviving sets of the game and people who know the rules. They visited a lot of farmsteads, asked for permissions to examine attics and sheds, and sometimes they would find surviving sets of the game or some remnants like game pieces. But they never met any people who knew or remembered how to play that game. So they started publishing short notices in magazines with requests to anyone who knew anything about that game to respond, promising them a reward. And after several months of search some gentleman showed up who explained them the game rules. The game was reconstructed and now it’s a usual part of any European game collection. – Did the games become more complex with civilization development? Is it safe to assume that they were quite primitive at the dawn of mankind? No, not necessarily. Sometimes more complex modifications of games would appear in due course, but usually simpler games also emerged together with more complex ones. Different people are attracted by different game systems. Some people enjoy thinking, some enjoy thrills, some like to be entertained, some others like extra difficult games, and then there are also those who prefer solitaire and Rubic’s cube. But this is not in any way related to civilization development. Humankind actually never had a primitive worldview. As soon as humans acquired an ability for logical reasoning and higher nervous function, they immediately began inventing new worlds, gods, rituals. Neanderthals already buried their dead with a stock of coal, food and weapons so that the dead person could light a fire, kill the prey, then roast it and eat it. You cannot possibly imagine how complex the first backgammon-type games were, and how closely they were related to religious cults and thus had very specific rituals and prohibitions. I once taught a class for third grade schoolchildren. I started my lesson with asking them what board games they knew. They gave me about 15-16 names and I wrote them down on the blackboard. Then I asked them: “Which one do you think is the oldest game? And which one is the newest?” They consulted each other for about a minute and then unanimously told me: “The oldest game is Monopoly, and the newest one is chess”. Their answer flabbergasted me! It took me some time to understand their reasoning behind that assumption. Children are not familiar with game history, so they decided Monopoly was the simplest game and hence it had been the first to be invented; chess is the most complex game so it has to be invented only recently. In the kids’ minds a simple game appears first and only after a while it becomes complex. But in real life there is no such pattern. – Tell me about the actual process of reconstructing the rules of some game. I will tell you how we reconstructed the oldest board game in the world – a Sumerian game discovered in royal tombs of the city-state of Ur in Mesopotamia. 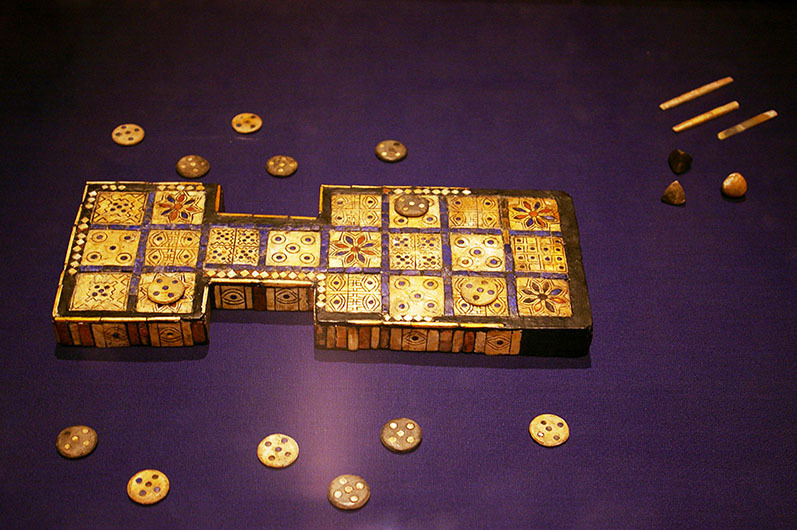 The game of Ur was first found in the 1920s in the form of a sizable box with two sets of pieces – 7 for each player. The pieces were flat and marked from one side. Three dices had two sides each: zero and one. Maximum points you could get by rolling the dice was 4 (it was exactly that amount that a player received when he got zeros on all three dices). The board had cells with various pictures on them. But it was absolutely unclear where and how to move the pieces. The Sumerian game originating in the city-state of Ur is considered to be the oldest board game in the world. 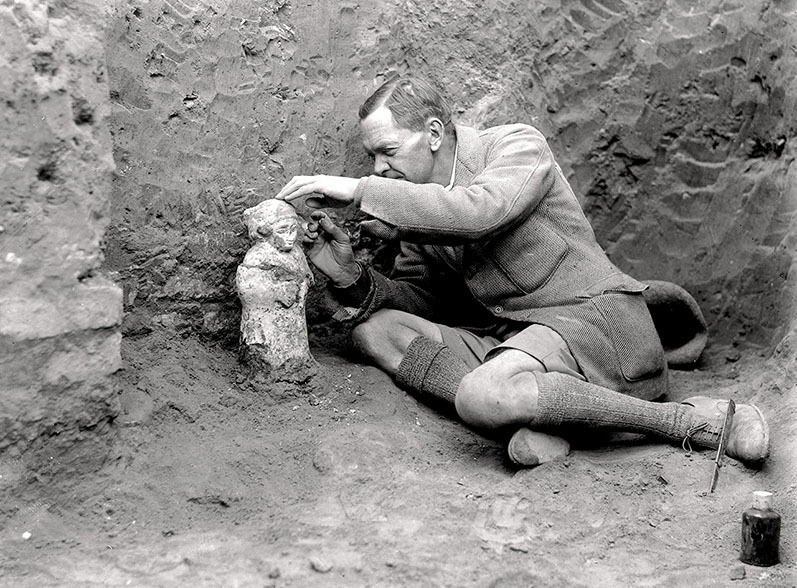 The honor of its discovery belongs to Sir Leonard Wolley (pictured) who led the excavation of the royal catacombs of Ur in Mesopotamia in 1926-1927. We started the reconstruction of the game by studying the works of our predecessors – well-known British board game makers and historians. The first rules that Robert Bell and Irving Finkel reasoned out were as follows: before the start of the game each player has 7 pieces. The player that gets 4 points on the dice first starts the game. According to Bell’s rules, the journey of the player’s pieces begins at that player’s half of the board, in the bigger part, on the closest cell to the bridge (fig.1). The piece moves towards the corner and the rosette cell, then goes to the adjacent cell in the middle row and moves along that line toward the smaller part of the board. After the piece reaches the end of the middle line, it turns toward its rosette and exits the board upon reaching it. Each piece’s travel was 14 cells; the final, 15th, would remove the piece from the board. The only place where it could meet the enemy pieces was the middle line. It looks like Bell did not put himself to any bother of extra thinking and chose the path of least resistance. The fact that it made the playability of the game approach zero and the difficulty be at a kindergarten level was of no importance to him. But what did the marking of the board mean? 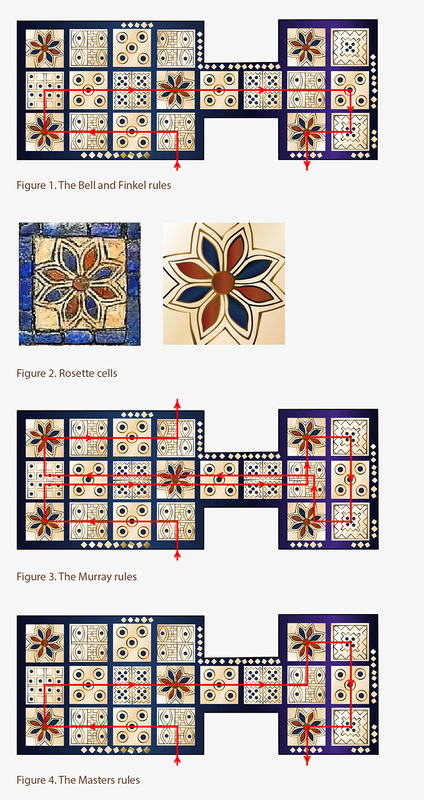 The discovered boards (which were quite a few) varied in material and craftsmanship but the disposition of the eight cells with rosettes (fig.2) on the board was always the same. This made the scholars assume that only the rosette cells are of any importance for the game. It’s possible that this ornament was related to the cult of the goddess Ishtar – similar eight petal flowers were depicted on both sides of the Ishtar Gate. This is why Bell decided that the piece on the rosette cell is safe and cannot be beaten by the opponent. Historian H.J.R. Murray was the first to assume that the rosette cells were extra move cells. This conclusion was drawn from a guess that the distance of 4 cells between the rosettes was equal to the most possible points per one throw of the dice. This was a breakthrough in the research of this game. And indeed, why would safe cells be located at the player’s own line where the enemy’s pieces could never get under any circumstances? The divisibility by four also meant that the pieces’ route on the board must have been different from what Bell supposed. Murray made an assumption that a piece did not just turn toward the rosette cell but made a loop – went round the whole smaller part of the board perimeter-wise, but upon reaching the rosette (which Bell and Finkel thought to be the final cell) did not exit the board but returned to the middle line and moved in the opposite direction instead. Then it came back to the starting zone and only then left the game. The piece’s route in this case would amount to 27 moves, with the 28th being the exit move (fig.3). Another board game maker, J. Masters, offered a sort of a compromise between the rules of Murray and Bell. Leaving the board, according to him, was to be executed akin to Bell’s rules – from the same final rosette cell on the player’s own side, but the movement pattern was different. After crossing the bridge the piece turned toward the rosette on the opponent’s side, then went round the smaller part of the board perimeter-wise and moved toward the rosette on its own side, then exited the board (fig.4). This idea was not thought through very well but it was the right idea on the whole. And at that point I began my own study of this game. The thing I paid attention to at once was that the pattern on the board did not look chaotic, it was quite meaningful. So I started to think about various possible meanings of ornaments on the cells. Look: the pieces fight each other all the time but how can I know which piece is going in one direction and which one is already going back? They can be standing on the adjacent cells right next to each other but be heading in opposite directions. It’s easy to get confused. And here is where the game itself should help: every piece was sole-colored on one side but spotted on the other side. That is, we enter the game “clean”, walk through the cells and at some point in the smaller part of the board, when the piece makes a backward turn, it has to be flipped upside down. So the piece made its way back with its spotted side up – that was a “veteran” coming home from the battle. Apparently, this game was symbolic of a military expedition across the river to sack a neighboring town. I began looking for the turning point. There are two pyramid cells in the smaller part of the board (fig.6), with none like them anywhere on the board. I tried to turn the pieces upside down here, but it led to jams appearing in the game. Then I tried to turn them when leaving that cell or passing through it – and the game started working at once. So I thought: if these cells work, then maybe other ones also mean something? The two cells marked by four “cinques” (fig. 7) were in the zone of the worst jams. So I assumed: what if these cells are exactly the “safety islands” on which up to four pieces could be placed on top of each other in columnar shape (and these pieces are flat)? The whole game was built around number four: four transitions from one rosette to another, four parts all cells are divided into. Besides, the game itself came to my rescue once again: if you place five pieces on top of each other in columnar fashion, they don’t remain standing – they fall down from a slightest movement, while four pieces keep standing wonderfully. After this, another idea came into my head: that spotted pieces can’t beat the clean ones, while the clean ones can’t beat the spotted ones. Accordingly, spotted and clean pieces cannot be placed on top of each other anywhere except the “safe” cells and the cells with “eyes”. The cells with “eyes” (fig. 8) – are “camps” where you could gather up to four of your pieces. The game thus acquired tridimensionality – and began working even better. But the biggest riddle was cells with five dots (fig.9). Here one unique fact helped me. There were several discovered boards for this game, and only one of them – the royal board – was decorated by such an ornament. The rest of the boards only had rosettes and… five-fold cells. So cells with dots did not mean a thing, they were simple ordinary cells which ancient artists considered non-aesthetic to leave with no ornament. The cell in the bottom of the larger part of the board is the finish cell (fig.10). It’s a safety cell for spotted pieces. A spotted piece placed here cannot be blocked or beaten. Many archaic games’ rules had an “untouchable cell” at the end of a piece’s travel. And indeed, it would be quite annoying and unjust if a piece would travel across the whole board and lose before the very end. This board is for its time an amazing example of a unique and aesthetic gameplay and a beautiful game model. It was designed by an obvious genius who came up with such ideas as the tridimensionality of the game, the “king effect”, the cross-movement of pieces. This game could have become a hit of its time if it hadn’t remained solely at the royal court. We think that we have disclosed about 98-99% of this game. And, frankly speaking, the thought that this game remained undisclosed for 5 thousand years after it had been invented scares me a bit. And to think that the rules were almost literally drawn on the very board, only nobody could really read and understand them. – Do you think there are certain games that cannot be “disclosed” at all? Yes, there are. For instance, the Zatrichion game (which by the way might not even be a game at all for all we know). A single copy of it was discovered during the excavation of the palace of Knossos on Crete. All game researchers who tried to study it failed; Murray, in the end, simply said: “This is anything but a game board”. – Let’s assume that the rules of some game that we know well – of chess, for example – will at some point be lost, will it be possible to reconstruct them? For instance, how would one guess that a knight should move in an L-shape? Most of the chess symbolism has nothing to do with the game itself. The chess pieces are abstract, but their symbolism pertains to the art of war and some social strata-related things but definitely not to the game. However, recently there appeared many new chess sets (such as Josef Hartwig’s Bauhaus school set) in which the pieces themselves explain how players should move them. If we suppose that a million years from now some extra-terrestrials will find such a chess set, they will probably uncrack them. But if they discover an ordinary chess set, this is unlikely to happen. – What about checkers or Go? Will they uncrack those games? 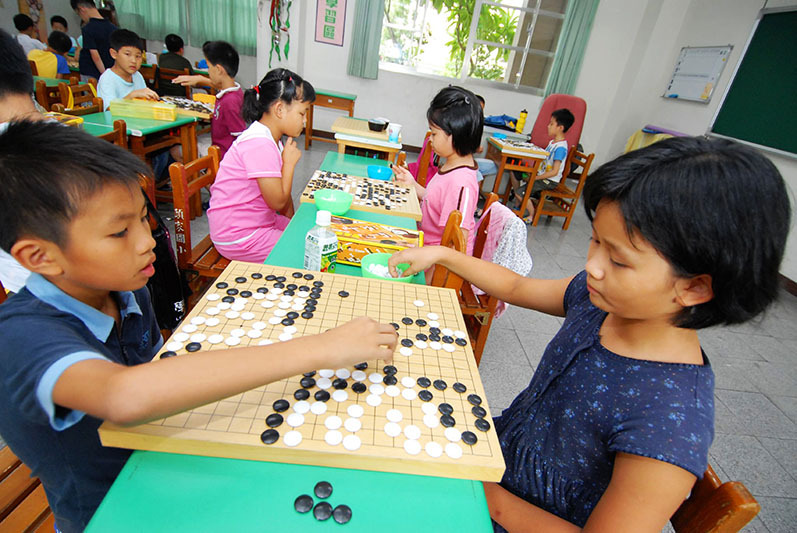 They will possibly uncrack Go, because the simplicity of Go rules and the general logical consistency of this game is such that if there are alien life forms somewhere in outer space, they most probably play Go. As for checkers, this game’s rules are so ambiguous that there is little chance to disclose them from scratch. By the way now there are about 20 versions of checkers while in the past there were about 50 more versions, and all of them disappeared. – In conclusion: what is more exciting – uncracking a game or playing it? Uncracking a game is a fascinating intellectual activity. But there is one catch: you can only uncrack a game once, while you can play it your whole life, as many times as you want. So I will say playing is more exciting after all, and that’s exactly what I recommend to everyone.